Crackerjack Charters | Fishing - Seward.com - Alaska Starts Here! Our office is located in the Seward Alaska Small Boat Harbor right on the boardwalk, directly behind the harbormasters office. Over 24 World IGFA Records since 1995! 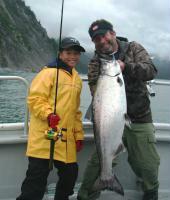 We've been fishing Seward Alaska for years & specialize in long range as well as daily trips. We are the first choice for quality Seward Alaska fishing charters.